This was a wonderful escape painting to sit down and create at the end of the work week. It is acrylic (mostly M. Graham, with Golden too) on 4 x 6″ stretched cotton canvas. Painting every day in May is a challenge, and a fantastic learning experience. I am enjoying it. I hope you are too. I hope this picture carries peace into your spirit today. And I wish for all of the moms, of both four-legged and two-legged babies, past and present, to have a wonderful Mother’s Day weekend. Yes, perfect for this hectic weekend. We’re going to be spending a lot of time on the road today and tomorrow. I’m scurrying around this morning trying to get blog posts scheduled, gifts wrapped, and at least some of my messy house cleaned up before we head out. Thanks for a restful moment. I’ll have visions of your painting in my head to call on when I did a bit of calm. Thanks so much, so glad it calmed you! Enjoy your trip and have a great Mother’s Day! Oh take me to that place, I needed a vision like that to take me away from this busy weekend, lovely colour choices. Thanks so much, Rebecca! I think it needs more light tones but it is dawn after all, so maybe it’s ok. I have so much to learn but I’m enjoying acrylics soooo much! Thanks for your visit and encouragement, as always. Very peaceful Laura. Sunset, seabirds and water below! Thank you, Denis, and I am so glad you are feeling the peace, my friend! Beautiful rolling waves Laura. The joy of your painting is coming through! Have a beautiful day! It is so very peaceful to look at! Beautiful! Thank you, Kathy! Have a wonderful Mother’s Day weekend! L, U R the Joy!!! Happy Mother’s Day! Very peaceful Laura and a perfect way to start my weekend. Have a great one – Happy Mothers Day. Thanks, Mary, you too! 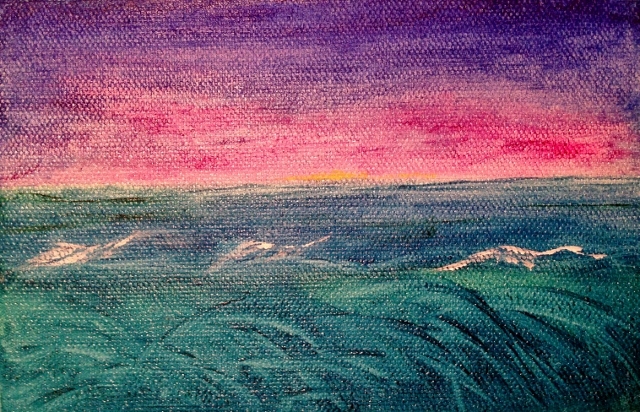 I wish I could do beach scenes in acrylic like you! I’ve not watched any videos on acrylic painting realistic scenes, and I need to, just trying to go with my heart on this. Can you recommend any books on painting in acrylics realistically? I so admire your work! Hi Laura, you paint with feeling and that trumps over any style – because as a viewer I can feel your work. I don’t have an acrylic book that I can recommend, haven’t purchased one yet. But if you are interested as I can recommend several seascape painting books – check out the book review category on my blog for several recommendations when you have a moment. Have a great weekend. Thank you Mary, what a kind thing to say! Wow, I really appreciate that. Have a peaceful, beautiful day! Yes! I was thinking of you! Have fun! love the colours – and how the structure of the canvas adds to the image! Thank you so much! I’d love to do a whole skyscape. That’d be a zen painting, if I could manage it. Thanks Kirk. Do you miss the windows? I am certain you’ll do more. Thanks Margaret! I think it is so cool that people are feeling joy and peace from this painting. I’m so glad you said this! If I could cook up ail lion canvases of joy, I would! This feels like looking out over grasslands to the sea. If you wanted to increase that feeling, you might add a tinted spatter—not bright white. Maybe a bluish-green tint?—to the white foam. Very nice. You’re making so much progress! Thanks, Maggie! I’m really new to acrylics, still, but loving them! Thanks for a terrific suggestion. Much appreciated! Thanks, Susan. As an acrylic painter (who can actually paint realistically(!!! )), this means a lot to me that you’re enjoying my work. I’m contemplating my bird for tomorrow…..thinking about trying it in acrylic paint. Wish me luck! Thanks so much for stopping by and encouraging me. I love acrylics, but sometimes feel like I’m walking on a wire without a net lol! Woot! 😀 Acrylics are more forgiving, but sometimes I still feel so insecure while painting. Much much easier for me to paint my feelings in the abstracts. Trying to make something look like something is easier with graphite or pen! Pointy implements lol! Looking forward to seeing your wc bird. I do admire wc painters who keep a good attitude and don’t quit. It can be a tough master, but it’s so wonderful when they turn out! Isn’t it the best feeling ever??? Oh and thank you so much for the compliment Laura. Much appreciated. High praise indeed. Realistic acrylic painters really astound me! And you’ve posted some beauties, Susan! Hugs to you for that one Laura! And thank you again. I think I am blushing. Thank you! Oh, what a nice comment; I’m thrilled to bring the eastern shore back to you in that painting! So glad you enjoyed it, Donna!